I’ve been working on our teeny tiny kitchen for a while now, so I thought I’d share some of my recent finds that make my life even more Flabulous!! Our obsession with Tupperware took an upturn with the first visit of the year to our local car boot sale. 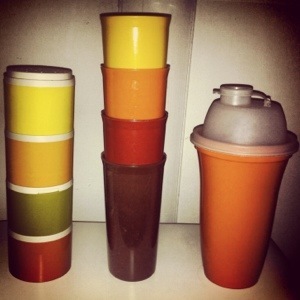 I’m loving these vintage colours and get flashbacks to my youth with the beakers (centre) we got, all in excellent condition. I’m also loving the spice stack (left) which uses the pot above as a seal whilst each pots lid is peppered with holes to shake out powdered spices. Finally the batter mixer was a real find, just top up with your ingredients and shake till mixed, it even has a pouring nozzle to make wicked american pancakes!! Lets talk about knives!! I love these beauties that I got for my 30th birthday, nearly 12 years ago, which are still in as good condition as when they arrived. The brand is Global and these aren’t cheap but I can honestly say that with regular sharpening these are probably the most useful present I’ve been given. 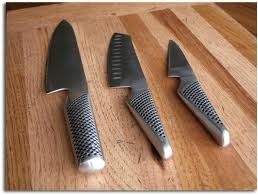 In addition to these I have a bread knife and that sets me up for all my culinary needs! 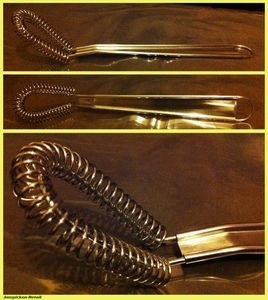 At the other end of the cost spectrum is my trusty magic whisk. It costs pennies but has lasted almost as long as my knives. I was introduced to this gadget by Nigella in her forever summer show way back in the day and I’ve never looked back. Whether its whisking an egg in a mug, sorting out lumpy gravy or making up a roux this baby does the job, without wasting a huge whisk or splattering everywhere. One big bonus is that it fits into the cutlery drawer of the dishwasher and sits on my magnetic knife rack so in my teeny tiny kitchen it’s perfect!! Next Post I saw this and had to share….